Make great custom presentations with any word processing, desktop publishing or presentation software with this transparency film. 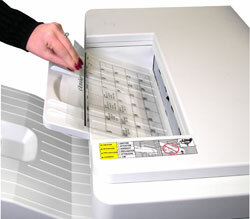 C-Line's crystal clear Inkjet Transparency Film is designed for use with most inkjet printers. The product features film that is specially coated on the print side for maximum printer ink adhesion. Each sheet features a removable tape sensing strip attached on the 8-1/2 inch side. Be sure to load the film in your printer so that it prints on the side without the tape and to allow the film to dry fully before using. Size: 8-1/2 x 11 inches. 20/BX.